Not the religious sort, more the “uh, duh” sort. Wikipedia describes this kind of epiphany as “an enlightening realisation that allows a problem or situation to be understood from a new and deeper perspective”. Sounds better than “uh, duh”, huh? It started a few months ago, though I didn’t recognise it for the turning point it has turned out to be. I’d head off to go shepherding, thinking, “Gee it would be good if the sheep would graze...” a specific spot. And there they would be, grazing it before I was in any way involved in the decision. I remember thinking, “Hm. It’s almost like telepathy.” That was a weird enough thought to go through a lapsed physicist’s brain to make me reject it more or less instantly. But it kept happening. The view at sheep’s eye level of the rank grass in the gully, just after the sheep passed through it in the previous two photos. To my utter surprise, over the next half an hour, the flock made its way through the dense gorse and long grass, through the steep and weedy gully and up the hill. Into the wind. As I gathered my wits, the epiphany hit me over the head: the sheep have learned what I’ve been trying to teach them for 18 months. I suspect high school teachers would feel equally astonished when their unruly, hormone-laden students grasp a concept that has been dangled in front of them for months. All this time, I was so focused on getting the sheep to trust me and accept my leadership, it simply never dawned on me they were really learning from me, from the shepherding process, how to feed themselves well on our property. I use “our” deliberately here, because they now “own” it, in the sense of knowing it thoroughly, as much as I do. And, hot on the heels of the initial epiphany, came the next one: it was time for me to trust them, as they have come to trust me. Time to trust their judgement about what to eat, when, and how to find what they need. The final bit of epiphany took a few minutes longer: honestly, I don’t need fences any more to “control” the way the sheep graze. I only need fences to protect new plantings of trees until they are mature enough to take care of themselves in a grazing context. But all the other fences are really for me, to help me feel in control. They aren’t there for the sheep, nor are they needed, now that the sheep know what they are doing and are prepared to search out forage over the whole property. One of those fences I don’t really need…Making a U-turn at the end of the Lucerne Paddock. This was today’s shepherding, getting them to graze down the lucerne (alfalfa) on one side of the fence, to the bottom end near the yards, and then a U-turn into the other side of the paddock, to graze back the other way. Worked beautifully–everybody followed the leader around the bend, with no one trying to break back along the fence line on the near side. I’m working on getting the flock to graze the annual grasses (barley grass and spear grass) that fill in the spaces between lucerne plants. 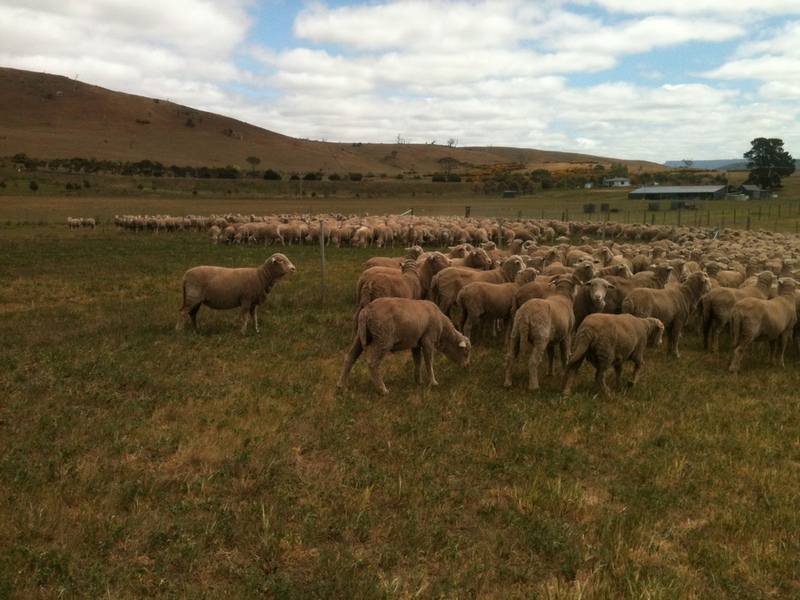 While the annuals are perfectly good forage, once they’ve gone to seed, the seeds will get in the wool, and even eyes, of the sheep, so there’ll be no more lucerne grazing for a few months after the next week or so. I stopped short of calling up my fencing guy and asking him to take down all the fences he put up for me last year, at considerable expense. But I did reconfigure the way I allow the flock to graze, opening up all the gates in a large section—a third to half—of the property at a time. I still shepherd, but in between the days I’m out there, I’m trusting the flock to work the grazing circuits the way they need to. And they are. Time and again I’ll think, “Next shepherding day, maybe I should take them…”, only to see them there before I get a chance to. Despite the desperately dry spring (no rain in October at all, and only 16 mm in September) the native plants are doing what they do so well–adapting to the vagaries in the climate they’ve evolved with. 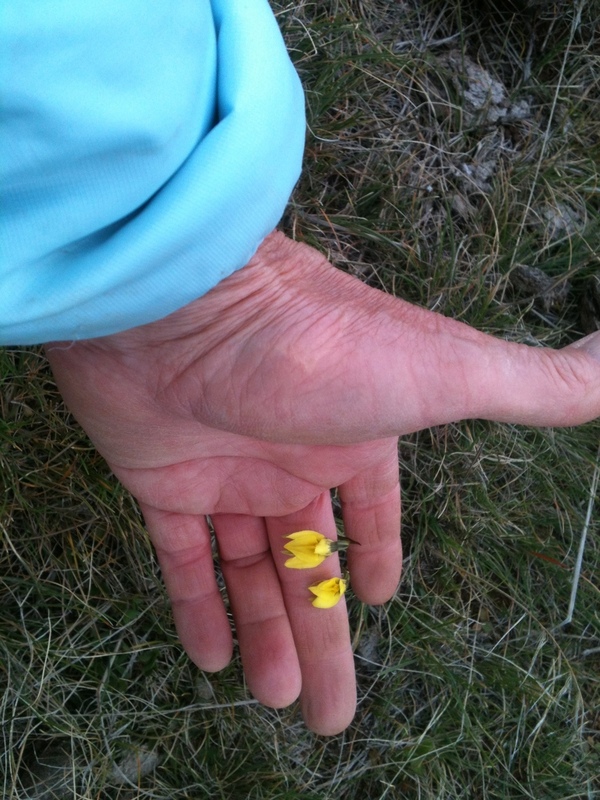 This is a tiny orchid I’ve not seen before on the property–common golden moths (diuris chryseopsis). Along with them, convulvulus, cut-leaf daisies, pussytails, everlastings, and new holland daisies are out in profusion. 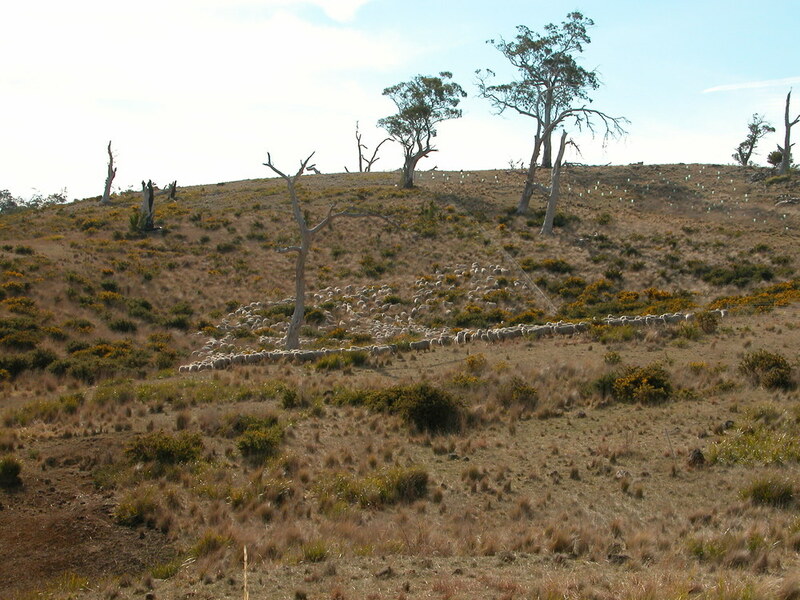 Just goes to show–we need to treasure our native ecosystems–they will be what allows us to adapt to climate change. They’ve been doing just that for ages. Literally. I’m not completely sure how this will play out going forward, though there are some aspects I’m confident about. First, I will never have to teach the whole flock these lessons again, as each new generation will learn from the older ones. Second, shepherding will become more of a meditative exercise for me than one of control. The illusion of control, and a desire to feel in control, I’ve decided, is a source not only of anxiety for the human involved, but inevitably results in more work for her. A recent photo of gorse dying out under the she-oak (casuarina) canopy. See the previous Yarn (Trip Report) for the full story. Some of the thousands of she-oak seedlings on one of my reserves. The day I took this I was collecting the cones for seed. I spent another day throwing the cones into dense gorse patches all over the property, in hopes they will germinate and extend the reach of she-oak gorse control. Some good news, and some sad: Sis, my 15-year-old border collie, had to be put to sleep a couple of weeks ago, with kidney failure. She did surprisingly well right up to the end—went for the morning stroll with the rest of us and had breakfast the day she died. A week or so ago, the rest of the dogs and I scattered Sis’s ashes at “Sis’s Corner”, the place along the track where she’d wait for the rest of us to come back from the long haul part of the day’s run. Sis just a couple of days before she died, catching up with the rest of us at the top of the last hill. She always got a ride down the last km or so. The swans have gone walkabout with the cygnets—I’m guessing there just isn’t enough water in Swan Lake to make it a viable place to raise their babies. Fingers crossed they’ve made it safely (walking, because it’s way too early for the kids to fly) to a bigger, better waterhole. On a happier note, a clutch of mountain ducks (Australian sheldrakes) has replaced the swans on Swan Lake. I found them this morning—10 little beauties. Mama mountain duck frantically calling her brood away from me, to little effect. Imagine how hard it must be to get 10 children to listen to you and do what you are asking them, especially if they’re in danger! And this year’s wool clip is sound! You may remember (Sweetness and Light, December 2014) I had trouble with last year’s ewe wool being “tender”—a result of a nutritional change during summer last year as I was just starting to figure out rotational grazing. Happily, no such problem occurred this year—they grew lots of wool, 16.5 to 17.5 micron, with excellent tensile strength (48 to 52 Newtons per kilotex, or thousand fibres, for those of you who like numbers) compared with 37 last year. All in all, one of the best clips I’ve ever had. I credit all the shepherding for getting them through a tough, tough year without any dramas. 3000 kg of White Gum greasy wool is due into Lyttleton Harbour, near Christchurch, NZ in a day or so. Newer PostBonus Track: How long is a piece of string?